While there are references in Sanskrit literature as far back as 1,000 BCE that 'Andhra' people were living in a region of present day Telangana, we have definite historical proof starting only from the Mauryan dynasty from the late 4th to early 2nd century BCE. Mauryan king Ashoka (265-238 BCE) sent Buddhist missions to the Andhra regions in the south. And the Buddhist Satavahana dynasty assumed power in Andhra in 1st century CE and came to control most of the Deccan region. 3 The rulers were patrons of diverse religions and built many temples and township. Their principal city Amaravati (now in Andhra Pradesh), contained Buddhist monuments that inaugurated a new style of architecture. Some of the renowned paintings in the Ajanta Ellora Caves in Maharashtra have been linked to the Andhra painters of that period. 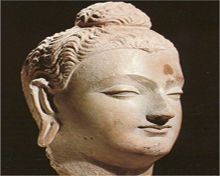 Buddhism prospered under the rule of Satavahanas and in their capital flourished the great Buddhist University. Nagarjuna (150-250 CE), the founder of Mahayana school of Buddhism, taught at this university. Andhra dynasties were in power till the 11th century when the eastern Chalukyas unified most parts of the region under on single administrative head. Under the Chalukyas, the first of the Telugu poets, Nannaya Bhatta, translated the Sanskrit epic Mahabharata into Telugu, thus paving the way for the growth of a new literary medium. During the 12-13th centuries the Kakatiyas of Warangal extended Andhra's power militarily and culturally by expanding trade activities to Southeast Asia. After establishing their supremacy in the north, Muslim rulers invaded the south. Meanwhile, Muslims had established themselves in the north and then invaded the south. Soon Warangal fell in 1323, but the rise of Vijayanagar emperor, southwest of Warangal, kept Muslim expansion in check for some time. Vijayanagar, one of the greatest kingdoms in Indian subcontinent, reached a peak under King Krishnadevaraya (1509-29 CE). His reign was known for military conquest, prosperity, just administration, and excellence in arts and crafts. Telugu culture and language thrived during the Vijayanagar empire. However, the Muslim principalities formed an alliance that led to the downfall of Vijayanagar dynasty in 1565 CE. Thus Muslims took full control of Telangana region. 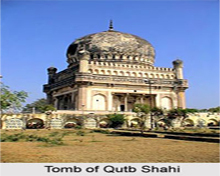 The Quṭb Shāhī kingdom in Golconda, near Hyderabad, was conquered in 1687 by the Mughal emperor Aurangzeb. European traders began to wield considerable influence in Andhra regions by 17th century. The Nizams of Hyderabad (a princely state) to consolidate their kingdom over rivals sought French and British support. By 1798 Nizam Ali Khan was forced to enter into an agreement that placed Hyderabad under British protection, although he maintained his independence on internal matters. Hyderabad extended its loyalty to the British during the second and third Maratha Wars (1803-05, 1817-19) and the Indian Mutiny (1857-58). The princely state remained a peaceful region even as the people in rest of the country gradually mobilised themselves and protested against the British rule in the late 19th and early 20th centuries. A movement to unite the Telugu-speaking people living under British rule with those under the Nizam's administration was slowly gaining support and activity. After independence in 1947, Nizam Osman Ali initially chose not to merge his princely state with Indian Union following which in September 1948 Indian troops invaded Hyderabad under Operation Polo. Hyderabad has no option but to agree to India's request in 1949 and became Hyderabad State in 1950.
to remain independent, but in September 1948 Indian troops invaded to force the issue. Hyderabad acceded to the union in 1949 and became a state in 1950. To the south and east, the Telugu-speaking Andhra region became part of the then Madras Presidency (now Tamil Nadu) but the Andhras demanded separate statehood. The Centre accepted their demand by creating on October 1, 1953, Andhra state from the northern portion of Madras. As part of a major reorganisation of Indian states in 1956, Hyderabad state was split up, and on November 1 the Telugu-speaking districts of Telangana were joined to Andhra state to form the new state of Andhra Pradesh. During the formation of Andhra Pradesh, a regional committee to safeguard the special interests of Telangana was set up and it had the mandate to ensure that this region which has many pockets suffering from socio-economic backwardness as compared to better off coastal regions of Andhra was given priority towards development schemes. But according to Telangana votaries, the disparities between their region and the rest of Andhra (coastal areas and Rayalaseema) grew manifold and by the late 1960s there were sporadic protests and agitations calling for a separate statehood for Telangana. In 2000s, there were strident calls, public rallies, hartals and day-long bandhs in Hyderabad and surrounding areas demanding the creation of Telangana state. A political formation which later on took the shape of Telangana Rashtra Samithi (TRS) was led by K.C. Chandrashekhar Rao whose main plank was achieving statehood. Followings years of discussions and high-level meetings at the Centre, it was agreed that Hyderabad, the capital of Andhra Pradesh and by far the most developed city, would remain the capital of both Telangana and Andhra state for 10 years. The Parliament voted for the creation of Telangana in February 2014 and on June 2, the 29th state of Indian Union, Telangana was formed and TRS chief Chandrashekhar Rao was named its chief minister after its first assembly elections.